Cindy's Stitching Korner: Lots to Share! I hope you are all having a wonderful week full of many blessings!! I am having a good week but had an Excellent and Awesome mail week last week!!! First of all, you can click here and see the giveaway that I won from Becky! Becky has had many giveaways lately and I was the lucky winner of one of them. It was a HUGE one! That is why I am using her pics, LOL) That is also the reason that I have not entered a bunch of your giveaways lately. I have entered a few but not many. I feel that I have already been so blessed from the ones that I have received lately that it was time to give others the chance to have a little better chance. Anyway, I received it this week and it was like Christmas for sure!! Becky, thank you so very much for your friendship and your generosity!!! You are amazing!!! 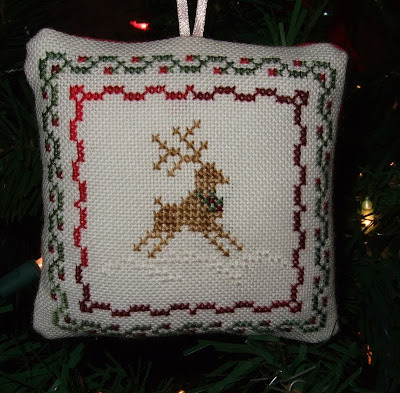 I also received this gorgeous ornie from a Christmas Ornament Exchange at Stitcher's Showcase. I just love it!! I also recieved the finished piece of the Quaker Sampler that I released a few weeks ago. It is Beautiful!!!!! Mylene done such wonderful and gorgeous work on this piece. I can not wait to frame it and hang it on my wall. Mylene graciously sent this piece to me to keep after stitching and said she would stitch for herself again. I also won a wonderful giveaway from Valarie. Even though this one has nothing to do with stitching, I just LOVE it!! I hoped to win this one so bad! Thanks so much Valarie!!! 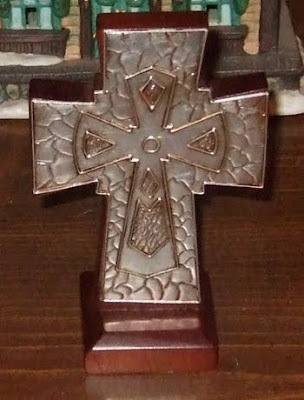 I love it and will treasure it!! SEE! I told you it was a wonderful mail week! On the stitching front, there is not much to share! What little time I have had to stitch has been spent on stitching a Christmas gift for a friend and since that friend reads my blog, I can not show you a pic of it! I am going to start on the stitching for my MIL birthday card this week but won't be able to show it until after the 20th. Hopefully I will have time for some other stitching between now and then though! Many people have been posting photos of some of their favorite onries from their trees, so I thought that I would join in. I don't have hardly any stitched ornies but do have a few. Hopefully with that Christmas Designs SAL, I will have many more next year! Anyway, so lets get started. I purchased these first two many years ago. Can you figure out what is is made of? Yep, it is an upside down light bulb! Really cool idea and I just love these two. Anyway, they were purchased the first year that my husband, daughter and I were together for Christmas. Of course, our son was not though of at that time. The Rudolph is my daughter, Candice's and the Grinch is my husbands and mine. As you can see, they are a bit worn. This was the Christmas ornament that my daughter made in Kindergarten and I guess that I was the last year that they made ornament in school around here because I don't have any others from her or any from my son! SAD!! My mom has all the ones that I made in grade school!! 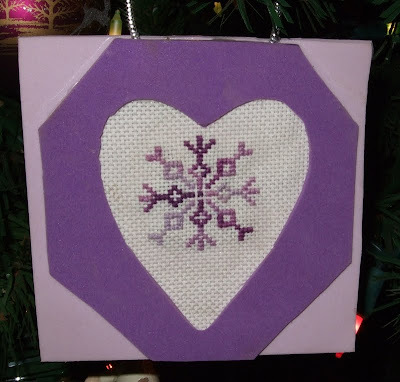 This is actually not one of my favorites but I it was the first cross stitch ornament that I made. I always complain about not having finishing skills, but when I look at this one I realize that they have improved over the years! LOL I still like this one though, even though it was not the best finishing job in the world! I hope that you all have a wonderful rest of your week. I will be trying to get caught up (again) on my blog reading in the next day or two! You guys are so awesome and I am so blessed to know each and every single one of you!!! Thank you for your friendship! wow, you did have a great mail week!!! And your tree/ornaments look great!! What a beautiful tree !!! I love the ornies ;-) But Christmas is my favorite time of the year !!! Congrats on your wins !!! YOu are such in a lucky time, you should enter my first Christmas giveaway if you haven't yet !!! It's a $56 Santa set ( the ornie will look great in your tree ! :-D) Help me spread the news !!! Thanks !!! Congratulations on all your wins. The ornaments are cute. My sister in law made my family light bulb ornaments last year. Very cute idea. Congrats on your wins - and I love your tree and ornies! Love your ornaments! They are so cute. Isn't it wonderful to have such beautiful mail. Congratulations on your win. I loved looking at your favourite ornaments. Congrats on your win. That's huge giveaway from her. I adore the reindeer ornament you received in the exchange! 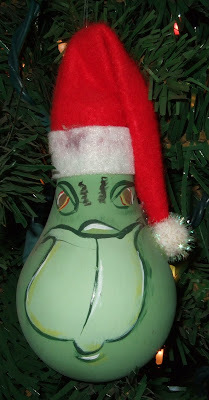 Those Reindeer & Grinch ornament made from lightbulbs are a freakin' HOOT! 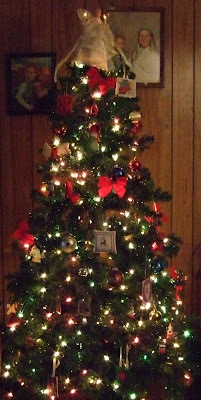 Love your tree, Cindy Mae! Congratulations on your wins--it must be your lucky month! 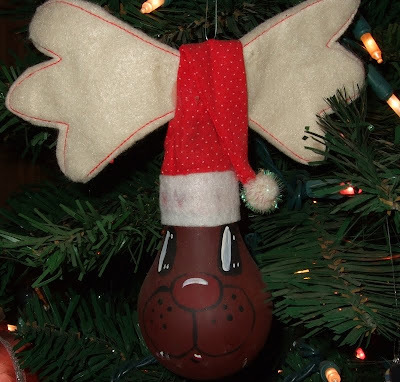 And I loved seeing your family ornaments--what a great idea to use a lightbulb! Sounds like a good week! I love happy mail myself it makes your day to get something you love! Congrats on your wins! I love all your Christmas decorations! Congrats on your recent wins! Your tree looks beautiful. I would love to eneter your giveaway. You have so many interesting things on your tree. Your tree looks so nice with all the ornaments. 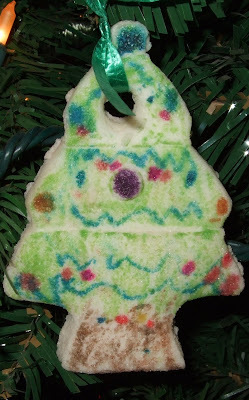 I also still have all the olde ornaments my kids used to make at kindergarten and at school. They are wonderful memories of the time when they were little. Finally my turn for a giveaway! !